The top four players in the bottom half of the NBA’s Western Conference by wins above replacement. From left to right: Ty Lawson, Ricky Rubio, Goran Dragic, Eric Bledsoe. After an offseason of homecoming parties, failed coups and depressing injuries, the NBA is back. 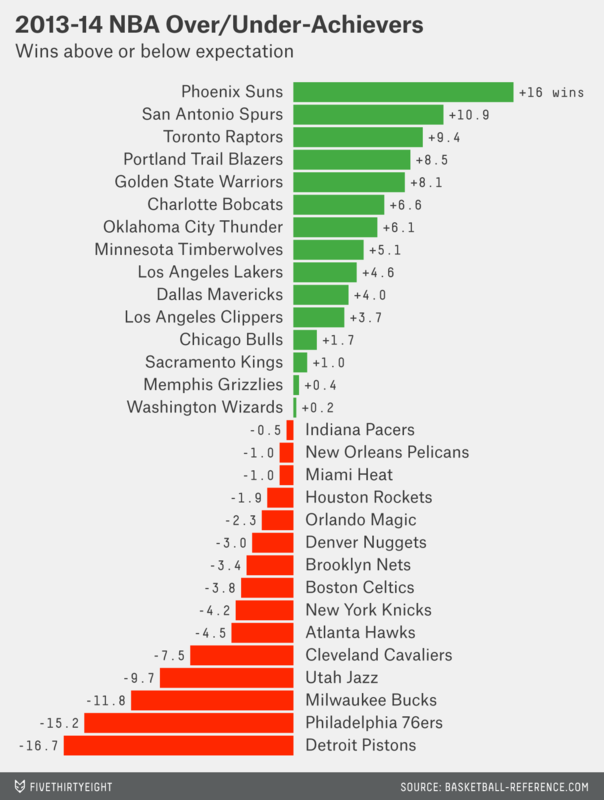 To celebrate, we took each player’s projected Real Plus-Minus and wins above replacement, calculated a total for each team, and ran 10,000 simulations of the NBA schedule to divine likely records and championship odds.1 We’ve split the teams into the lower and upper tiers in each conference; these are the seven teams that likely won’t make the playoffs from the West. So ease into your red wine bath (hi, Amar’e) and let us tell you the stats, x-factors or regressions that offer a preview of the coming season. As Kobe Bryant returns from the leg fracture that limited him to six games in 2013-14, the Los Angeles Lakers are hoping he has one more playoff push left before he ends his illustrious career. But that’s going to be hard to do with this supporting cast. The Lakers are coming off a 27-55 season, the highest single-season loss total in franchise history. And perhaps more troubling, they received an unusually small amount of production from their future Hall of Famers, traditionally the franchise’s bread and butter. According to a wins above replacement (WAR) variant I computed based on a combination of Player Efficiency Ratings and Win Shares,2 the Lakers have received an average contribution of 20.6 WAR per season from their Hall of Fame-bound players,3 which places them second to the Boston Celtics’ 21.8 mark among NBA franchises since 1951-52. 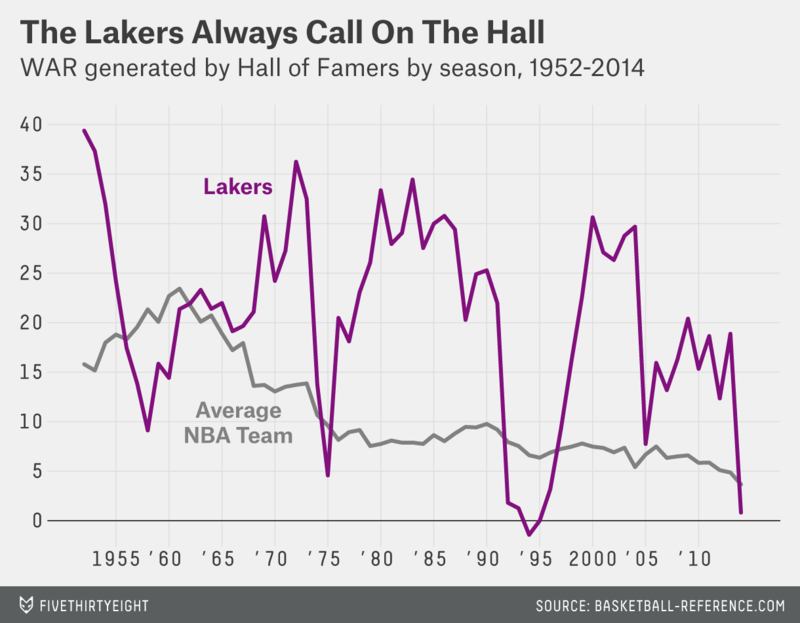 During the decade of the 1980s, and again in the first five seasons of the 2000s, the Lakers got more than 28 WAR per season from Hall of Famers alone. And from 2006-2013, as they won two more championships and another conference title, the Lakers received an average of 16.4 WAR from Hall of Famers per year. But last season, the Lakers’ future HOF contingent — which included Bryant (who has a 100 percent probability of making the Hall according to Basketball-Reference), Pau Gasol (61 percent) and Steve Nash (55 percent4) — generated just 0.8 WAR, the lowest such output Los Angeles has received since 1994-95, when nary a single Hall of Famer suited up in forum blue and gold. The rueful joke about the Lakers, at least from fans of the league’s other 29 franchises, is that they consistently manage to “pick up a HOFer or two every 4 years or so when their team’s playoff performance starts to slide a little,” in the words of one Internet commenter after LA was on the verge of acquiring Dwight Howard in 2012. And it’s basically true: Shortly after George Mikan’s career wound down, Elgin Baylor and Jerry West reported for duty, to be joined later by Wilt Chamberlain. Soon came the next wave: Kareem Abdul-Jabbar, then Magic Johnson and James Worthy, whose departures were followed within a few years by the arrivals of Shaquille O’Neal and Bryant. And four years after O’Neal left, along came Gasol. The supply of Hall of Famers rarely goes un-stocked in Laker-land. That’s why, as a rule, the Lakers don’t stay bad for long. The team has only suffered back-to-back losing seasons twice since 1961, and in each case it snapped back above .500 — and stayed there for an extended period of time — starting the very next year. The Lakers appeared to follow their classic “pick up a HOFer” formula when they eventually did snag Howard. But the cycle was, for once, broken; after a single disappointing season in LA, Howard did the unthinkable, spurning the Lakers for the Houston Rockets. 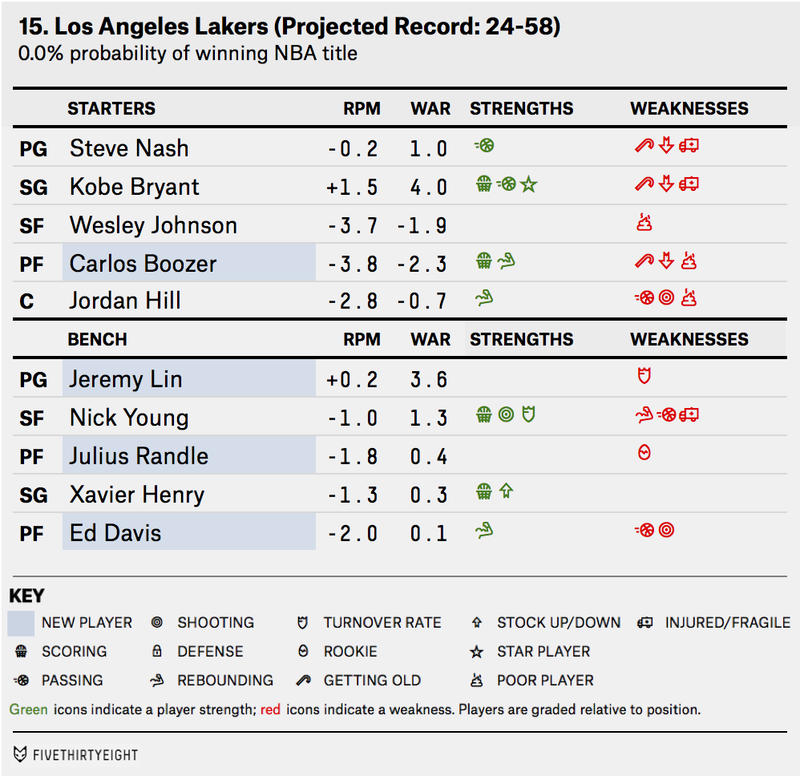 Now the only future Hall of Famers in sight are the 36-year-old Bryant and 40-year-old Nash, as newcomer Carlos Boozer has but a 7 percent chance of ever making the Hall, and overhyped rookie Julius Randle will probably be lucky to be more than a bench player in the NBA. As Gordon Hayward went, so went the Jazz. And last year, neither went far. Heading into restricted free agency, Hayward finished last season with a career-low true shooting percentage of 52.0 percent and an ugly career-low 3-point percentage of 30.4 percent. The Jazz were 25-57. Given those shooting struggles, it may seem strange that the Charlotte Hornets signed Hayward to a max offer sheet this summer, and that the Utah Jazz matched that contract, retaining him. But Hayward has a diverse array of offensive skills and, perhaps more importantly for a Jazz team without many standout players, he’s a workhorse. The full nature of Hayward’s offensive responsibilities are probably best shown by Seth Partnow’s True Usage statistics, which measure total offensive involvement, including a player’s assists and potential assists (as calculated by SportVU Player Tracking statistics). True Usage can be read as the percentage of a team’s offensive possessions involving a player when he takes a shot, gets fouled, turns the ball over or creates a scoring opportunity for a teammate. Hayward’s True Usage was 42.33 percent last season, 11th among all wing players and roughly the same as Carmelo Anthony’s. He also had an Assist Usage5 of 18.38. That number was fourth among all wing players, and roughly the same as LeBron James’s. Even though Hayward didn’t shoot well, the Jazz’s offense was better by 3.3 points per 100 possessions with him on the floor. From the Jazz’s perspective, the key to getting value from Hayward’s massive new contract, and getting the most out of his versatility on the court this season, is asking him to do less. 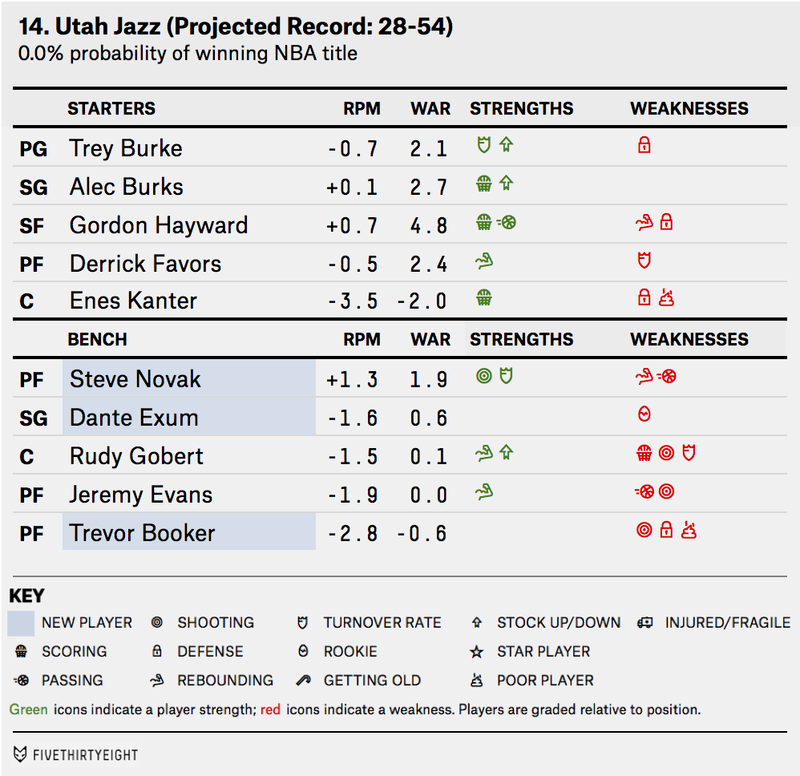 Alec Burks and Trey Burke will both have another year of experience, and explosive rookie Dante Exum will probably have the ball in his hands plenty. Hayward’s shooting percentages should climb this season as he works slightly more off the ball, finding shots by spotting up, cutting to the basket or driving against a defense that has already shifted. The Kings began their offseason with a move that confused many in the NBA, especially those who do analytics. In July, they decided against re-signing excellent young point guard Isaiah Thomas, and replaced him with Darren Collison. Last season, Thomas scored 20 points per game with a 57 percent True Shooting Percentage, the 10th-best mark for a point guard in the NBA, while maintaining a 35 percent assist rate and shooting 52 percent on drives to the basket. 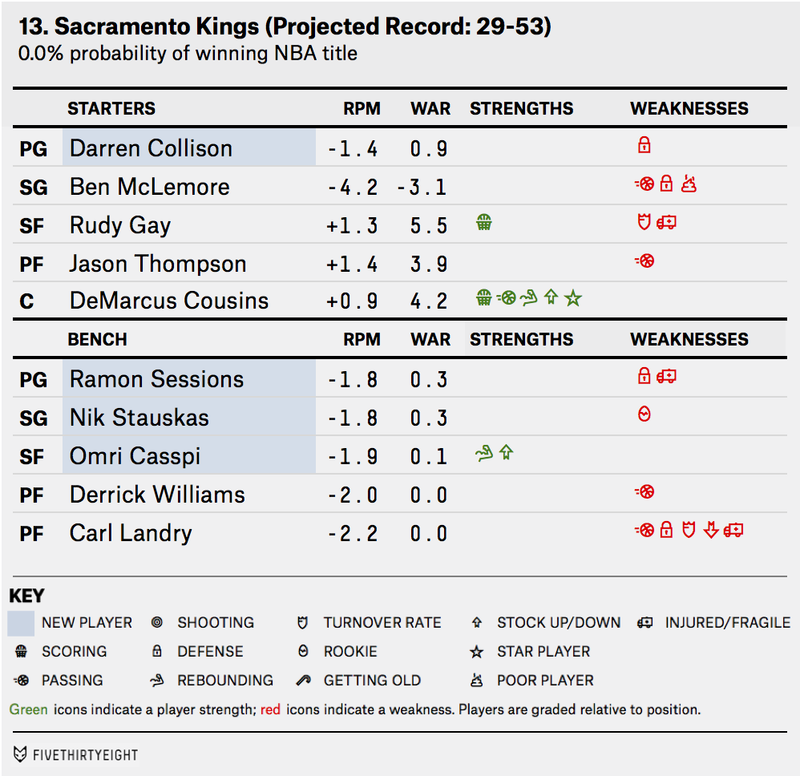 Collison is an effective shooter, but he is inferior to Thomas in almost every other statistical category. He had one of the worst assist rates (22 percent) for a point guard who played more than 2,000 minutes last season, turned the ball over more frequently than Thomas, and had one of the worst Defensive Real Plus-Minus marks (-3.23) for a point guard. What makes the move even more puzzling is that the Kings didn’t save that much salary: only $1.5 million per year. The Kings’ roster turnover has been dramatic since the beginning of last season (when 23 different players suited up for the Kings). Both point guards, Collison and presumed backup Ramon Sessions, are new to the team this year, as is rookie shooting guard Nik Stauskas. They’ll have to mix in with DeMarcus Cousins and Rudy Gay, who are coming off successful World Cup campaigns for the U.S. national team. It’s a defining season for both players, as Cousins is entering what should be his prime and Gay is in a contract year at the end of a much-maligned max deal. Both of them love to shoot — Russell Westbrook and Kevin Durant are the only pair of teammates who can match the duo’s elevated Usage Rates (32.7 percent for Cousins, 27.6 percent for Gay) — and it’s likely their Usage Rates will climb with Collison running the point instead of Thomas. Shaw’s push for more threes was aided by the arrival of Randy Foye, a gunner for hire, who hoisted 498 3-pointers last season (11th most in the NBA). Wilson Chandler, too, set a career high for threes attempted. 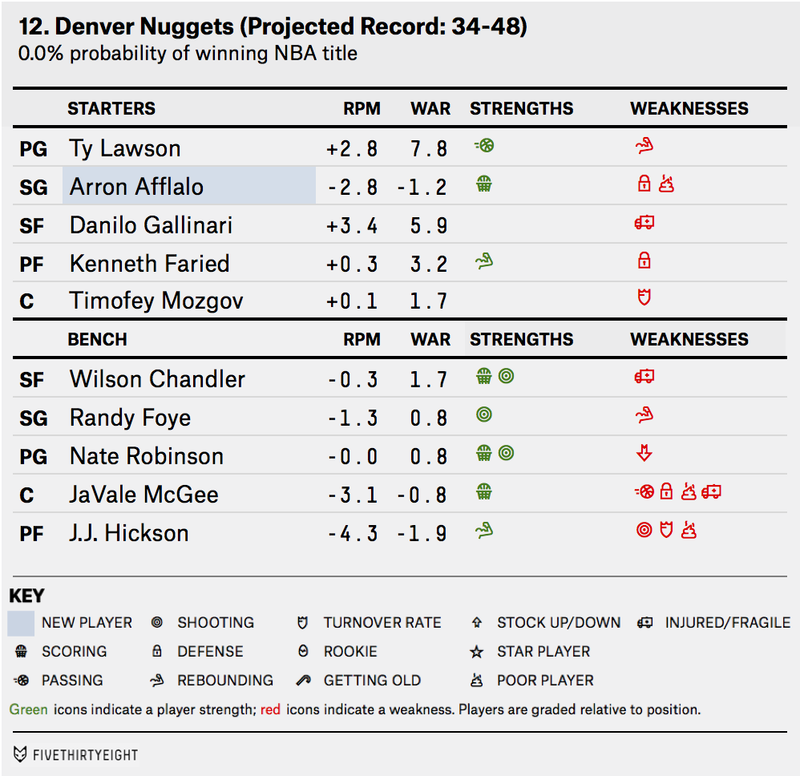 The return of Arron Afflalo, acquired from Orlando in the offseason, figures to increase Denver’s 3-point launching. Afflalo shot 42 percent from three on 300 attempts last season. But Afflalo’s threes — especially the corner threes — are welcome. Afflalo shot 49 percent from the corner three spots last season, a success rate that will bolster the Nuggets’ already potent attack. Denver was the third-best team from the corners last season, connecting on 42 percent of its attempts. Much of Denver’s ability to generate corner threes will depend on Ty Lawson and Nate Robinson. Both excel in getting to the rim and causing the defense to collapse, but Lawson is the better at finding 3-point shooters. Thirty-one percent of his 542 assists last season were on 3-pointers, and 52 were from the corner. Anthony Davis cannot generate any more hype — there’s that much of it already. Fresh off a dominating performance at the FIBA World Cup (54 percent shooting from the floor, 6.6 rebounds and 2.1 blocks per game), Davis is poised to make the jump into the game’s elite. Last year, when he wasn’t on the bench with a fractured hand, Davis put together an offensive season that was nearly as good as any by a second-year power forward or center in the past 30 years. If we look at his Offensive Rating7 versus his Usage Rate,8 Davis produced a season matched only by Shaquille O’Neal and David Robinson, scoring at an efficient rate while using more than 25 percent of his team’s possessions. Of course, not all of Davis’s stats were world-beating last season. According to Evan Zamir’s invaluable NBA WOWY9 database, New Orleans allowed as many points per possession (1.10) when Davis was on the court as when he was not. And despite his 6.7 percent block rate (most among players who played more than 2,000 minutes), Pelicans opponents took a larger percentage of their shots at the basket and made a larger percentage when Davis was on the floor. While Davis definitely has improvements to make defensively (see Zach Lowe’s excellent feature for details), New Orleans had other defensive shortcomings last season. Which is why the Pelicans signed Omer Asik. 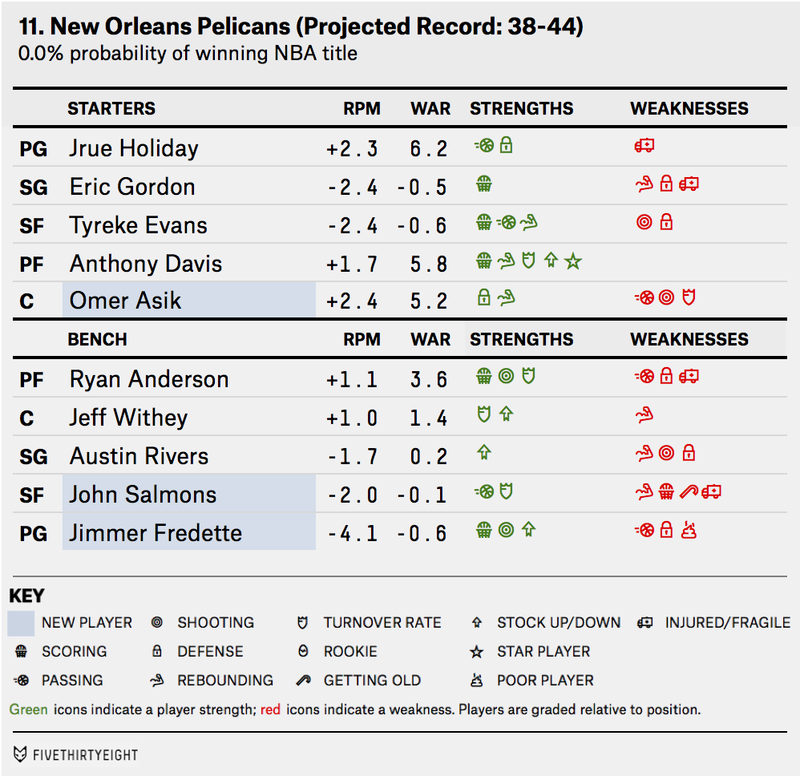 Asik was one of the best defensive centers in the league according to Real Plus-Minus,10 and should provide Davis with a legitimate defensive backcourt partner who might be able to complement his athleticism and uncanny ability to block shots. With Kevin Love gone, the Minnesota Timberwolves are starting over after trading away a homegrown superstar. (Sound familiar?) Rather than sit through another season of rampant Love speculation,11 Timberwolves coach/general manager Flip Saunders decided to move on with whomever he could get for Love — a haul that included the No. 1 overall picks from each of the past two NBA drafts (Andrew Wiggins and Anthony Bennett), plus under-appreciated veteran Thaddeus Young. Minnesota preemptively unloaded Love in part because it was unable to convince him that his teammates were good enough to win. And certainly the Timberwolves didn’t do enough winning to even make the postseason a year ago, finishing just 40-42 in what was supposed to be a strong playoff push for the team.12 Amid the rubble of another frustrating season — which came in spite of Love’s ongoing statistical brilliance — the weak-supporting-cast argument was tough to overcome. But the 2013-14 Timberwolves were a better team than their wins and losses indicated. Their Pythagorean record — i.e., the record we would have predicted them to have based on their point differential — was 48-34, good for seventh in the Western Conference. After adjusting their average margin of victory for strength of schedule, Minnesota was the ninth-best team in the NBA last season. That would have shown up in the standings if not for Minnesota’s dismal record in close games, which led to the seventh-most negative disparity between actual and Pythagorean wins of any team since the 1976 ABA-NBA merger. And as much as we extol the virtues of execution in crunch time, these differences are, traditionally, mostly the product of bad luck. It’s very possible the Timberwolves would have enjoyed a reversal of fortune in 2014-15, had they simply kept Love. 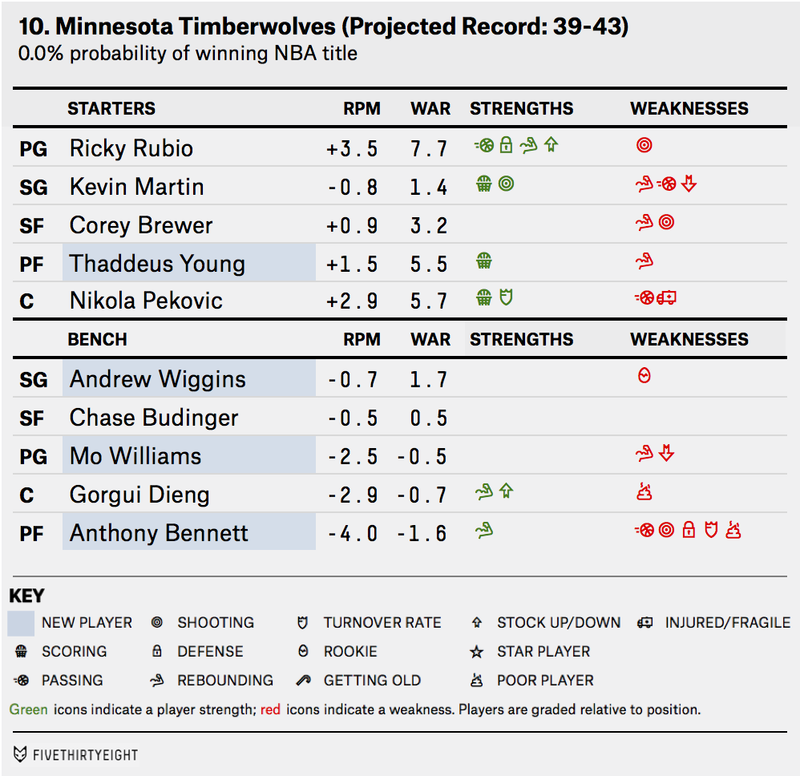 Instead, the Wolves are counting on the development of Wiggins, Bennett and 2014 No. 13 overall pick Zach LaVine to boost an existing core that includes Nikola Pekovic and FiveThirtyEight darling Ricky Rubio. But although Wiggins was regarded as a once-in-a-generation prospect in high school, his college numbers suggest a future better described by “solid starting wing” than “next LeBron.” Meanwhile, Bennett is coming off one of the worst rookie seasons in NBA history,13 and LaVine’s undistinguished stats at UCLA have me wondering if he’s doomed to follow in Joe Alexander’s footsteps as a workout warrior turned draft bust. Last year was the second time Jeff Hornacek made history as an overachiever for the Suns. The first came in 1989. As the third leading scorer, at 13.5 points per game, on that year’s team, he was a key factor in its historic run. Even though the Suns were swept by the Los Angeles Lakers in the Western Conference finals that season, they were the greatest overachievers — defined as actual wins relative to what we would expect before the season14 — of any team going back to 1980. The 1989 team was expected to only win about 33 games, and finished a whooping 26 games better than expected. Last year, Hornacek’s Suns joined Hornacek’s Suns. Except this time he was their coach. In his first year as a head coach, he made the 2013-14 Suns the 13th-greatest overachieving team of all time, earning 48 wins instead of the projected 32. Those 16 wins over expectation were by far the best of any team last year. Last year’s Suns team was solid offensively. While fast-paced and led by speedy guards Goran Dragic and Eric Bledsoe, it ranked eighth in relative pace. Fast, but not like Steve Nash’s “:07 Seconds Or Less” Suns. 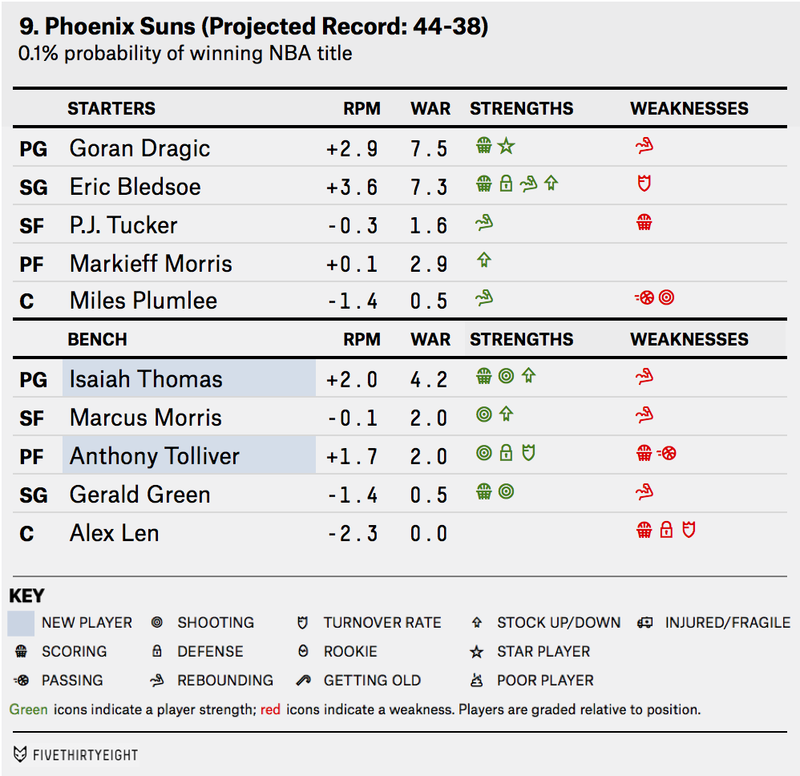 The 2014 Suns’ relative offensive rating was eighth. For overall efficiency, they were 10th. The rosters we used came from ESPN.com’s depth charts, and were current as of Monday, Oct. 20. For those curious, I regressed PER and Win Shares per 48 minutes onto Real Plus-Minus (RPM); you can estimate a player’s RPM using the formula 0.15*(PER – 15) + 30.5 *(WS48 – 0.1). I then made sure the minute-weighted average of a team’s estimated RPMs scaled to the team’s efficiency differential for the season in question, and computed WAR using the same process FiveThirtyEight editor-in-chief Nate Silver employed in this article. This statistic is useful in cases where RPM (for which data only exists going back to 2000-01) or even Statistical Plus-Minus (which extends back to 1976-77) are not available; Basketball-Reference.com computes WS and PER going all the way back to 1951-52, the first year the NBA kept track of minutes played. Or future Hall of Famers, as determined by Basketball-Reference’s Hall of Fame probability statistic. Admittedly a lowball figure, this is an artifact of MVP awards not being factored into the Hall of Fame probability method. Assist Usage measures the percentage of possessions a player is on the floor in which he creates a scoring chance for a teammate. Beaten only by the Phoenix Suns’ amazing 7.3 threes per game increase. Offensive Rating measures offensive efficiency by estimating how many points a player produces through made shots, free throws, assists and rebounds per 100 possessions. Usage Rate measures how many of a team’s possessions he “uses” up — via shooting, drawing fouls or turning the ball over — when he is on the floor. Real Plus-Minus is the latest version of Adjusted Plus-Minus, a measure of a team’s point differential when a player is on the court vs. off it. Read more about it here. Love could have opted out of his contract after the 2014-15 season, opening up the very real possibility that he would leave Minnesota as a free agent with no compensation at all. Although they did increase their win total for the fourth consecutive season. By any rookie, much less a No. 1 overall pick. These backward-looking retro-predictions use the Statistical Plus-Minus (SPM) metric devised by FiveThirtyEight’s Neil Paine, and the SPM projection system devised by FiveThirtyEight editor-in-chief Nate Silver. 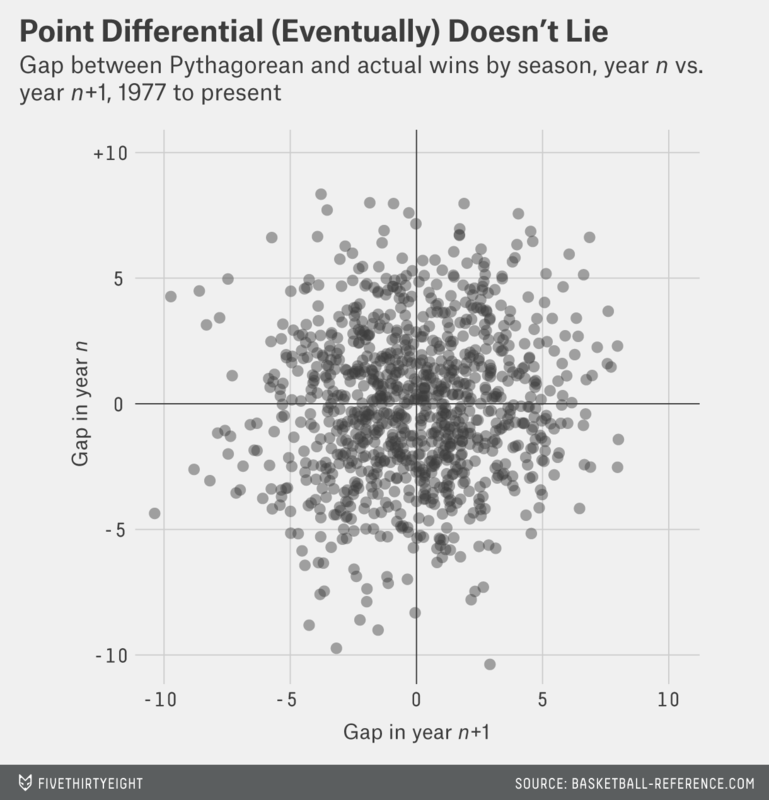 They allow for estimates of how good a team “should have been” in a given season (based on how its players performed in preceding seasons) going back to 1979-80. We Looked At Almost 2,000 Mock NFL Drafts. Here’s What We Learned.